Seaweed-eating fish are becoming increasingly voracious as the ocean warms due to climate change and are responsible for the recent destruction of kelp forests off the New South Wales north coast near Coffs Harbour. 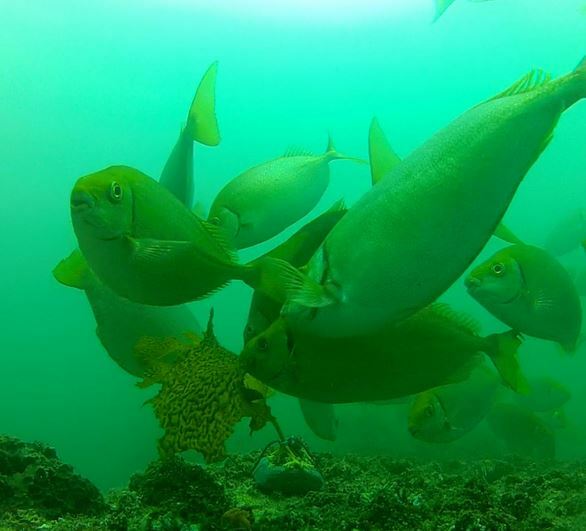 A frenzy of rabbitfish feeding on kelp transplanted by a UNSW-led team of researchers off the coast of NSW in eastern Australia. During the 10-year period, kelp disappeared completely from all study sites where it was initially present. At the same time, the proportion of tropical and sub-tropical seaweed-eating fish in these areas more than tripled. Grazing also intensified, with the proportion of kelp with obvious feeding marks on it increasing by a factor of seven. The results of their study have been published in the journal Proceedings of the National Academy of Sciences. During the study, the researchers also carried out an experiment in which they transplanted kelp onto the seafloor. They discovered that the rabbitfish and drummer fish were the most voracious, consuming the fronds within hours at an average rate of 300 bites per hour. "The number of fish that consumed the smaller algae growing on rock surfaces also increased, and they cleared the algae faster when there was no kelp present. This suggests the fish may help prevent kelp regrowing as well, by removing the tiny new plants,” said Dr Vergés. The decline of kelp might have major economic and management impact in Australia, where kelp forests support a range of commercial fisheries, tourism ventures and recreation activities worth more than $10 billion per year.